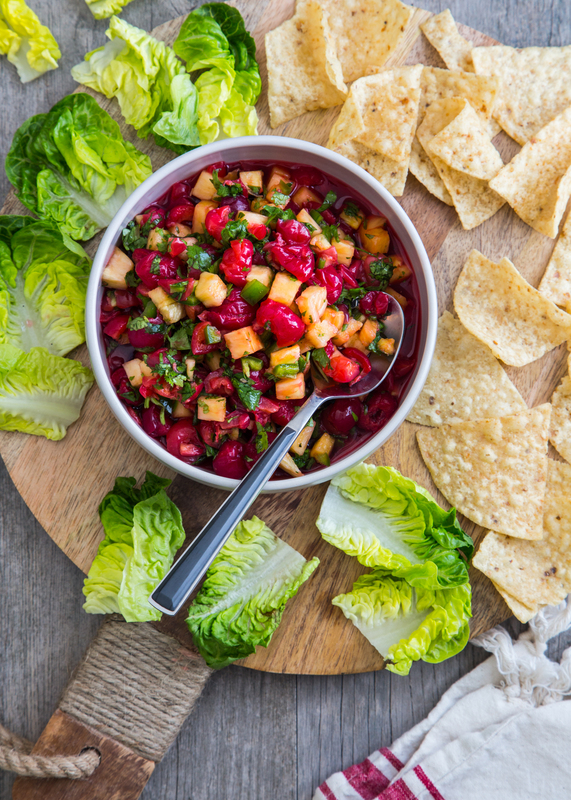 This post, Montmorency Cherry Pineapple Salsa, is sponsored on behalf of The Cherry Marketing Institute. All opinions are, as always, my own. Thank you for supporting the partners that I love and that help make Jelly Toast possible. School has started, friends! Perhaps it’s because I’m getting older or maybe because the kids are, but this year seemed to start more smoothly than in years past. Things like fundraisers, school supplies, and teacher assignments just didn’t seem to faze me. I’m becoming confident that the kids can handle a new year, with new challenges, new class, new routine, etc. and totally own it. That a little failure or stumble here and there is not going to completely flatten them but rather give them life experience and a chance to learn and grow. I’m proud of them. I am taking a page out of their book and embracing changes in myself. Changes in my attitude, changes in my goals, changes in my creativity, and changes in my inner self. I picked up a Fitbit last week as a way to help motivate me to make some good choices for my health. Moving more throughout the day is becoming a big goal of mine. Working from home, I will find myself glued to my computer editing video or photos for hours on end without so much as taking a step. Not good. The fitness band is helping. Another big change that I’m really trying to embrace is an honest-to-goodness appreciation of summer. I admit that summer and hot weather will never be my favorite and I accept that. But, this year I have really tried to focus on the positives that come along with warm weather rather than dwelling on the negatives (I’m looking at you, humidity). I have been focusing my attention on the activities that are possible when the weather is warm like golfing, swimming, camping, and grilling – which are all things that I love. My brother and sister-in-law live just down the street from us and it’s made this summer so fantastic. Getting together with them and their kids or inviting friends over for an impromptu cookout in the evenings has made this summer one of my favorites. Trust me, I’m all about the impromptu cookout with very little planning. 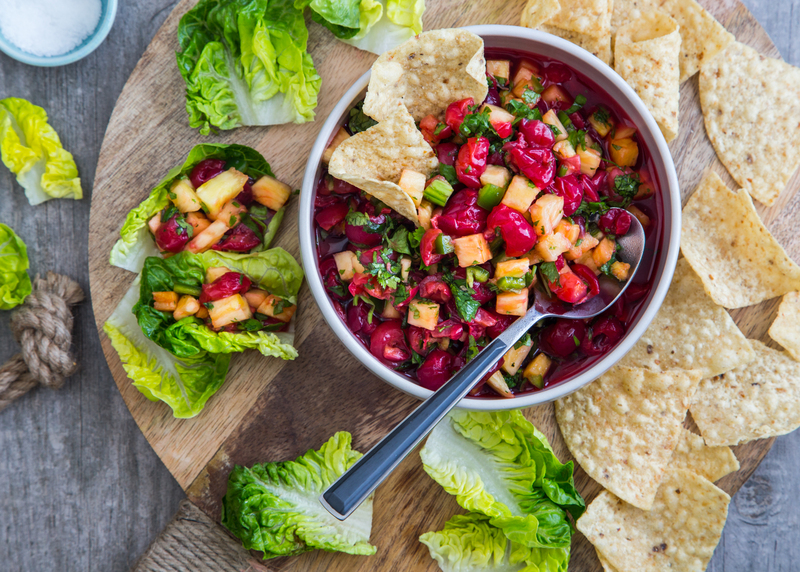 Last week, we had my brother and his family over and I threw together a quick and beyond easy Montmorency Cherry Pineapple Salsa as a snack before our grilled pork tenderloin. I’m a huge fan of fruit salsas and decided to try my hand at using frozen Montmorency Tart Cherries as the main ingredient. I keep several bags of these cherries in my freezer at all times because they are awesome for baking (like these cherry pies or tart cherry apple crisp) as well as in smoothies, but did you know that you could thaw out frozen Montmorency Tart Cherries and use them in a fresh salsa like this? Well, you totally can and it worked like a dream. The tartness of the Montmorency cherries created a great bite and balance when mixed with the super sweet pineapple and spicy jalapeño. Plus, the fact that they were frozen and thawed gave them the perfect soft, juicy texture to help hold the entire salsa together. 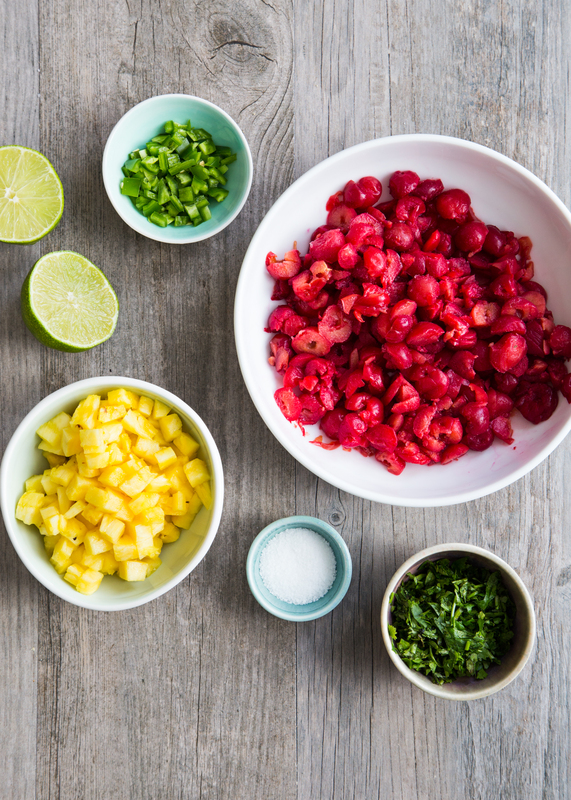 I can’t make any salsa without cilantro and this cherry pineapple salsa was no exception. A kick of lime juice and a sprinkle of salt and that is it, friends! I was so sure that I needed to do more work for this because it seemed almost too easy, but after making it several times and everyone at our cookout giving it the thumbs up I was reassured that it really can be that easy. We used salty, crunchy tortilla chips to dip but also pulled out some little baby gem lettuce leaves to make mini lettuce wrap snacks which was a fun twist. We even got crazy and spooned some over our grilled pork tenderloin. 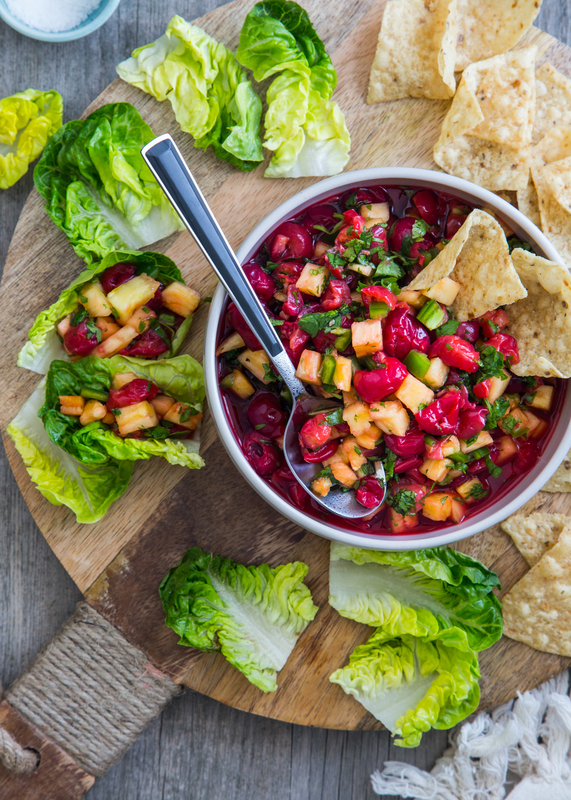 Seriously, this Montmorency Cherry Pineapple Salsa is that good. You guys know I Iove my tart cherries and am always happy to find another way to serve them up. In the spirit of loving summer, let’s embrace these last few weeks and get outside for some family time, cookouts, and great food. 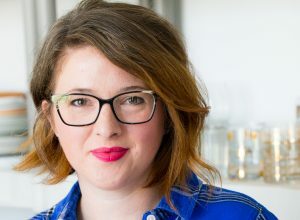 For more amazing summer recipes using Montmorency Tart Cherries, visit ChooseCherries.com. 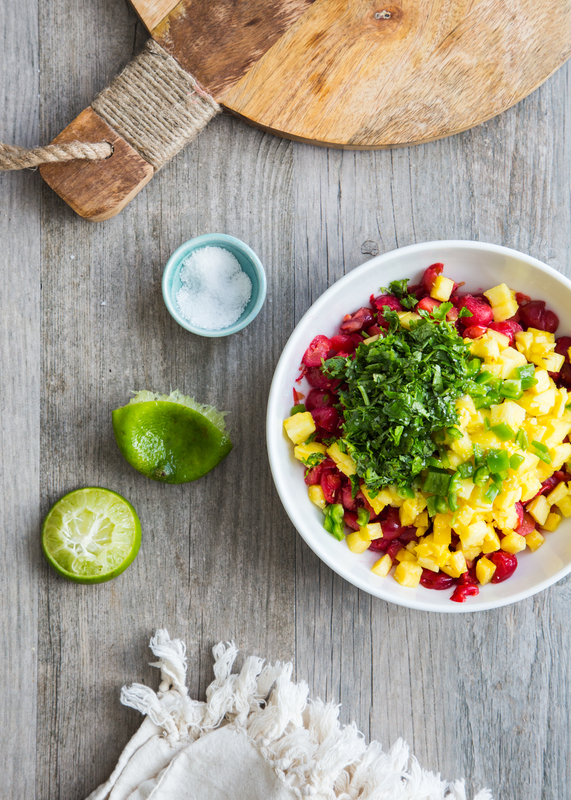 Mix all ingredients together in a medium bowl until well combined. Serve with tortilla chips or baby gem lettuce leaves. Salsa can be prepared a day ahead of time. This looks and sounds delicious, love the vibrant colours!